Buckle up your seat belts; the future is here. What seemed like a far- fetched idea has now materialised thanks to the great minds at Samsung who recently unveiled the Galaxy Fold phone packed with cutting- edge technology. Thought to release in the US on 26th April and in Europe on the 3rd of May this year, the phone has taken nearly a decade to create. 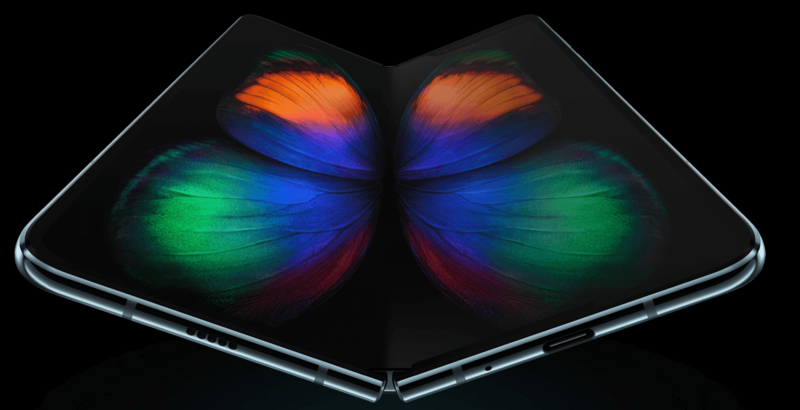 Priced at least £1,820, Samsung has made it clear that the Galaxy Fold is a premium device, hence the steep price point. The invention naturally integrates two pieces of technology, the mobile phone and a tablet into one device offering synergy to the user’s discretion. Unlike any other phone in the market today, the Galaxy Fold has the ability to fold in half like a piece of paper. The device can be used as a regular mobile phone handset with a 4.6in Super AMOLED cover screen on the outside which then unfolds to reveal a large 7.3in Infinity Flex Display screen on the inside, which can be used as a tablet. The phone has two separate screens between the two modes. To achieve the unique folding mechanics and for it to work, Samsung had to create a unique polymer screen layer that is reduced in thickness which makes it slim and moldable compared to ordinary smartphone screens. This unique structure also gives the screen the ability to fold in half without separation between the two screens. When creating the screes, each layer of it had to be capable of folding and repeatedly bending without breaking to allow Samsung to launch the Fold. Packed with the latest technology, the device is available in both 4G and 5G making it a crucial product for Samsung, providing them leverage over their Chinese rivals and competitors such as Apple. The phone hosts a total of six cameras, one on the front screen for those all-important selfies when the phone is closed, two on the big screen and three on the back, offering consumers a device with a lot of punch in a slim, sleek design. The Galaxy Fold has a strong and powerful metal hinge with hidden gears which allows for a smooth interchange between the two available screen sizes. The hing separates the back of the device into two sections and hides the interlocking gears that carefully transition the device from folded to flat. The phone is powered by a pair of batteries, totalling 4380mAh, which is too little power for a tablet and too much power for a phone. The use of two batteries could revolutionise other devices such as laptops, bringing to the market transferable technology. Samsung also aimed to make sure the two sides were balanced, with electronics and batteries distributed to ensure an even weight distribution. The phone also comes with its own software called App Continuity, which switches between screens as you open and close the phone. The device can detect what screen is in use and display the visuals correctly as the app resizes other apps to fit the larger screen when it is unfolded. The Fold also comes with 12GB ram and 512 GB of storage. With these credentials, it is thought to be the most powerful smartphone available to purchase today. Although the Fold is quite advanced, of course, it comes with some first-generation problems. To begin with, like many of Samsung’s other models, there’s no subsurface fingerprint reader, but it does share a side mounted fingerprint reader just like the cheaper S10e. Its front-facing cameras on the inner display are positioned on a notch at the top on the right-hand side of the display which takes up space on the screen, making it less noticeable compared to other S10 devices. The launch of new technology like the Fold means consumers are in for a treat in the coming months and years. As the rivalry between competitors becomes fierce, as consumers we can look forward to innovations and inventions, increasing the capacity and capabilities of the smartphone market, where technology could transition to wearable technology. Wristwear such as watches and bracelets as we know them now could potentially turn into the next latest craze transferring flexible screen technology.